Next to the combination of chocolate and peanut butter, there are few combinations that I love more than chocolate and cream cheese. Whether it’s in the form of a cheesecake, or something like these brownies, I swoon. I love how the richness of the chocolate is cut with the cool creaminess of the cream cheese. I have been wanted to find a perfect cream cheese brownie recipe for the longest time, and finally made it my mission this week to get it done. These brownies are an amazing blend of rich brownie and perfectly creamy cheesecake. 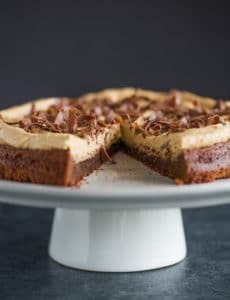 In fact, there are very much the exact inverse of the Brownie Mosaic Cheesecake. 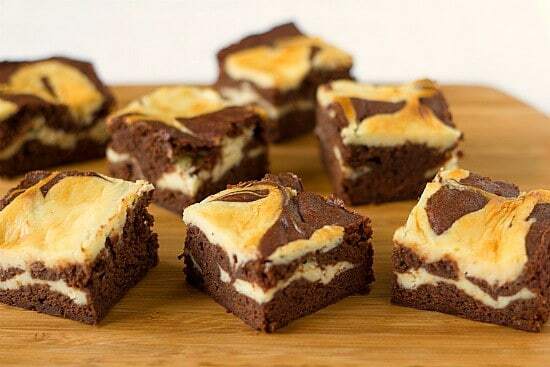 Instead of a cheesecake with chunks of brownie in it, here we have brownies with swirls of cheesecake. Such a lovely little ying and yang. 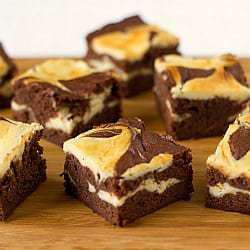 This is a basic brownie recipe that is layered with a cream cheese filling, and then marbled to create layers and swirls of cheesecake within the brownie. It’s the prettiest version of this type of brownie that I think I’ve seen. I love them! A word of caution: be very careful not to overbake these. I would recommend checking them about 5 minutes before they were supposed to be done. I usually do that, but got a little sidetracked, so these baked for the minimum time (50 minutes) and they were a little too done – the toothpick test came out clean, when ideally it comes out with moist crumbs when you’re dealing with brownies. So just a head’s up that you may want to check on them a little early. 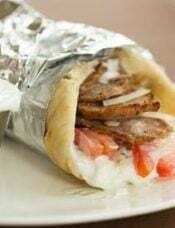 Otherwise, enjoy every sinful bite of decadence! 1. 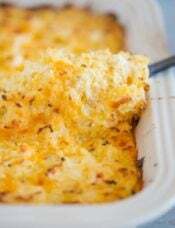 Adjust an oven rack to the lower-middle position and preheat oven to 325 degrees F. Butter an 8-inch square baking pan. Fold two 16-inch pieces of foil lengthwise to measure 8 inches wide. Fit 1 seet in the bottom of the greased pan, pushing it into the corners and up the sides of the pan (the overhang will help in removal of the baked brownies). Fit the second sheet in the pan the same way, perpendicular to the first. Butter the foil; set aside. 2. Whisk the flour, salt and baking powder together in a small bowl; set aside. 3. In a medium bowl, combine the chocolate and butter. Microwave in 30-second increments at 50% power, stirring after each, until completely melted and smooth. Whisk in the sugar and vanilla extract; allow the mixture to cool slightly. Whisk in the eggs, one at a time, fully incorporating each before adding the next. Continue whisking until the mixture is completely smooth. Add the dry ingredients and whisk until just incorporated. 4. Make the cream cheese filling by beating the cream cheese, sugar, vanilla and egg yolk together in a small bowl until evenly blended. 5. Pour half the brownie batter into the prepared pan, spreading it in an even layer. drop half the cream cheese mixture, by spoonfuls, over the batter. Repeat, layering the remaining brownie batter and cream cheese filling. 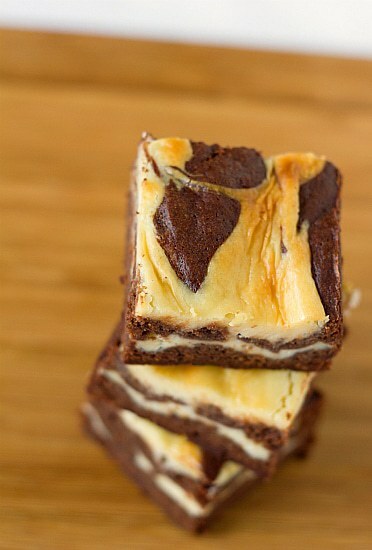 Use a butter knife to gently swirl the brownie batter and cream cheese filling, creating a marbled effect. 6. Bake until the edges of the brownies have puffed slightly, the center feels not quite firm when touched lightly, and a toothpick or cake tester inserted into the center comes out with several moist, fudgy crumbs adhering to it, 50 to 60 minutes. 7. Cool the brownies in a pan on a wire rack for 5 minutes. Remove the brownies from the pan using the foil handles. Place the brownies on a wire rack; allow them to cool to room temperature. Refrigerate until chilled, at least 3 hours. Cut into squares and serve. The brownies can be stored in an airtight container in the refrigerate for up to 5 days. Since I’m making these for a crowd, I doubled most everything except for the chocolate and cream cheese filling. I just swirled the cream cheese filling on the top. Poured into a 9×13 pan. They were still very chocolatey and absolutely fantastic! Very good recipe. This recipe turned out perfectly! My brownie batter seemed too thick – it glopped instead of pouring – but once baked they were amazing. 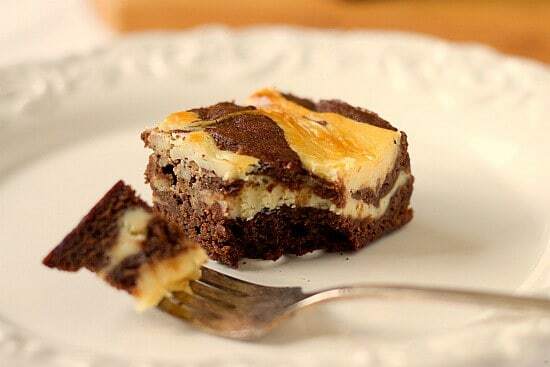 Best cheesecake brownies ever. Real quick to make too. I can’t believe I haven’t left a comment about these yet! I’ve made them several times. They are my perfect football dessert! I love this recipe! With so many amazing recipes in the world, I don’t often reuse recipes, but this one is one of the few exceptions. Thank you so much for sharing! 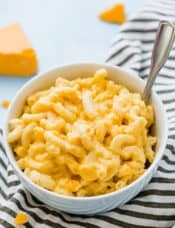 I made this recipe last night (August 2018), and it turned out fantastic! 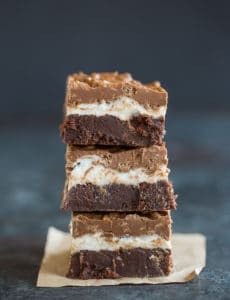 Our family likes the fudgy texture and flavor of the box mix brownies, and when I realized that I was out of the mix and planning on making cream cheese brownies, I searched for a recipe and came across this one. I was surprised at how much this brownie tasted like the “goodness” that we so enjoy with box mix brownies. It was excellent! It is a thick, fudgy brownie with the perfect amount of cream cheese. Thank you for the recipe! All the measurements are wrong. Bake Brownies an hour, Are you crazy. Bake sale them on foil-no way. This recipe is a mess. Made the cheesecake brownies for a friends birthday. They were delicious and very easy to make. They were a big hit and I would make them again. 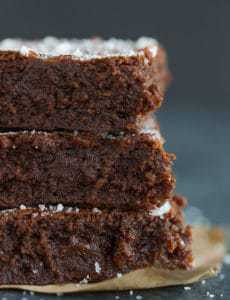 Are these more cake like brownies? Can I leave out an egg to make them more fudge like? Hi Andrea, They are a little more cakey than fudgy. I haven’t tried playing around with this particular recipe, but you could try eliminating an egg, or reducing the flour. I just made these yesterday and I am so glad I found your recipe! I have been depriving my taste buds all my life by using boxed brownie mixes. They turned out perfect! I was a bit shocked by how amazing the flavor was. I neglected to heed your tip about checking these five minutes before the 50-minute mark and when I removed them at 50, they already seemed “well done”: there were no crumbs on the toothpick at all. 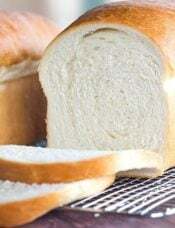 Is this the reason they turned out dense and kind of dry? Otherwise, they were very tasty! A very good use for my leftover cream cheese. Hi Vanessa, If they were dry, they were probably over baked a bit. I’m glad you enjoyed them, though! 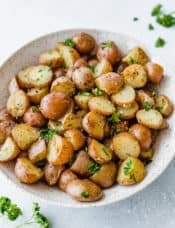 Can i double the recipe, and put it in a 11 x 7 pan? Hi Ana, If you double the recipe an 11×7 pan will be too small; you’ll need to use a 9×13. We have made these no less than twenty times and they are still our favorite! My only change is 1teaspoon of almond extract in BOTH the brownies and the cream cheese mixture….. To die for! Thanks again Brown eyed baker! I made this recipe but tweaked it a tad – like adding seedless raspberry jam! Turned out deliciously. I love this recipe!!! I always had this desert at a local restaurant (wamed with a scoop of ice cream). Always wanted the recipe and here it is . Thank you so much . 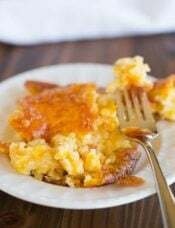 Your blog is one of my favorites and your recipes are GREAT! Keep up the good work. Question for you – I made these yesterday and they came out a little too cakey for my liking. They taste awesome, I just like my brownies really fudgy. Next time I want to only add one egg but I dont know how that will affect the cream cheese? What do you think? Hi Ren, I think you would be okay only using one egg. Or you could try integrating the cream cheese filling into another favorite fudgy brownie recipe. It looks so delicious, Even i showed this blog to my mum and she promised me that she will prepare pizza for me from this browni recipe. And i love to have it. I love the look of this brownie. No doubt it tastes a enticing as it appears to be. I made cream cheese brownies from David Lebovitz’s new cookbook recently and they were divine. You should try them! I will put these on my list for comparison.